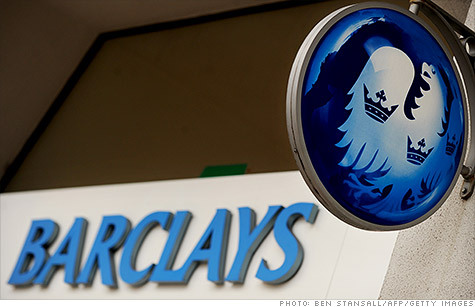 Barclays made a robust profit in the first half, but apologized for its role in the Libor scandal. NEW YORK (CNNMoney) -- British bank Barclays apologized for its role in the Libor scandal Friday as part of a report showing a robust first-half profit. "These remain challenging times for Barclays, as well as the industry, and we are sorry for what has happened because of recent events," said Marcus Agius, who resigned as chairman on July 2. He has promised to stay with the company until a replacement is found. Barclays (BCS) said that its adjusted profit, before taxes, jumped 13% in the first half to £4.2 billion ($6.6 billion). Barclays said its after-tax profit jumped 9% in the first half to about £3.1 billion ($4.8 million). Its earnings jumped to 21.8 pence (34.3 cents) per share in the first half from 19.6 pence (30.8 cents). "I am confident we can and will repair the reputational damage done to our business in [the customers'] eyes and those of all our stakeholders," said Agius, in a letter to shareholders included in the earnings statement. Last month, Barclays agreed to pay $453 million to settle manipulation charges brought by U.S. and U.K. bank regulators and law enforcement officials. The bank admitted participating in a scheme to fix two key lending rates including Libor, which affects as much as $350 trillion in loans and derivatives. The scandal forced out former chief executive officer Bob Diamond on July 3. "We continue to address the operational and control issues raised in connection with our Libor settlement with the U.S. and U.K. authorities, many of which have been resolved over the course of the investigation," said Agius. "However, as a consequence of recent events, the board of directors is now focused on identifying and recruiting a new chief executive as well as a chairman of the board." The Libor rate -- currently used to calculate trillions of dollars in consumer and business loans around the world -- has been in the spotlight since revelations that Barclays manipulated Libor to benefit trades and its own bottom line. Libor is used to set interest rates on mortgages, loans and swaps contracts worldwide.